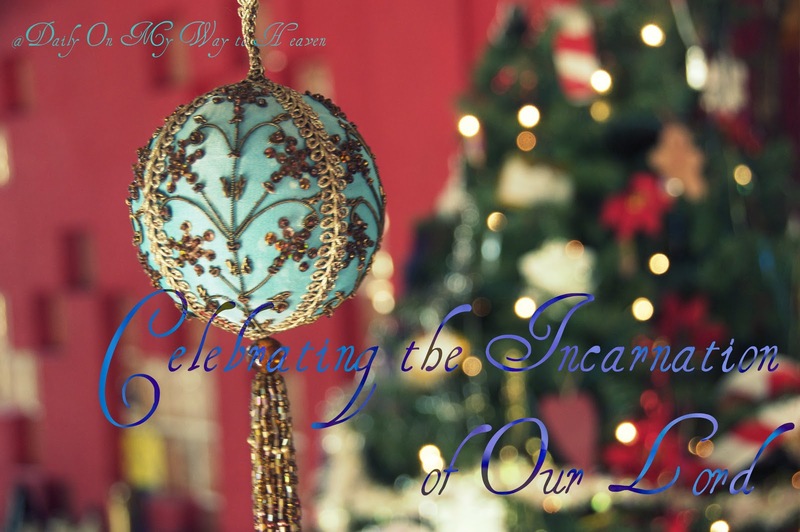 This is the last post on this series, Celebrating the Incarnation of our Lord. 7Then Herod summoned the wise men secretly and ascertained from them what time the star had appeared. 8And he sent them to Bethlehem, saying, "Go and search diligently for the child, and when you have found him, bring me word, that I too may come and worship him." 9After listening to the king, they went on their way. And behold, the star that they had seen when it rose went before them until it came to rest over the place where the child was. 10When they saw the star, they rejoiced exceedingly with great joy. 11And going into the house they saw the child with Mary his mother, and they fell down and worshiped him. Then, opening their treasures, they offered him gifts, gold and frankincense and myrrh. 12And being warned in a dream not to return to Herod, they departed to their own country by another way." The shepherds heard the angels; the wise men followed a star... but wait, look carefully, take a second look. The star did not guide them at first to Jesus; the star was their guide to Jerusalem first, not to Bethlehem. It was in Jerusalem, however, where the wise men found the only way to the Saviour. It was there where they heard what the Scriptures said about Jesus' birth. It was, then, by the Scriptures that they arrived to Bethlehem. Luther says "They followed the Word, and God comforted them by putting back the star"
This is the only way we can come to Jesus, to know Him, through the Word of God. The wise men believed what the prophet Micah had said, they believed God's Word and so they walked towards Bethlehem, the mad and troubled king with its troubled city were left behind. Jesus revealed Himself in the Scriptures to them and to us; we won't find Him through Science, or Astrology, or "prophetic voices"; He is the Word; His Word is the only way to know Him, to see Him. I don't understand how people sell only New Testament Bibles, or why people give away only the gospel of John to unbelievers. We need the whole counsel of God. It is in the Law that we find our sin, it is in the Old Testament that we see Jesus veiled, only to find Him shining as the Bright Morning Star in the New Testament. The Scriptures is the best gift we have received, many have given their lives for it; it is also the best gift we can give. Tonight children in Mexico go to bed expecting the coming of the wise men to leave them presents by the tree while they are asleep. Children leave one of their shoes by the tree, just to make sure that the wise men won't get confused about which gift goes to which child. This year we want to give, to bless children around us that haven't heard the gospel, so we bought bibles, illustrated bibles to give away to them. We are excited about this little project; my prayer is that they will find, through faith, Jesus in the Scriptures, that as they open up the unexpected gift, they'll unwrap Jesus. I encourage you to take advantage of this beautiful opportunity, to meditate on the marvelous gift we have received: The Scriptures that point us to Jesus. Let's read the Word, let us abide in the Word, it is the only way to know Jesus. Gene Veith writes on Epiphanies. At Conjubilant Song read about The Feast of Epiphany.